Groundwater quality in the 633-square-mile (1,639-square-kilometer) Northern Coast Ranges (NOCO) study unit was investigated as part of the Priority Basin Project (PBP) of the Groundwater Ambient Monitoring and Assessment (GAMA) Program and the U.S. Geological Survey (USGS) National Water-Quality Assessment Program. The study unit is composed of two study areas (Interior Basins and Coastal Basins) and is located in northern California in Napa, Sonoma, Lake, Colusa, Mendocino, Glenn, Humboldt, and Del Norte Counties. 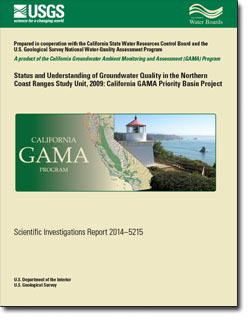 The GAMA-PBP is being conducted by the California State Water Resources Control Board in collaboration with the USGS and the Lawrence Livermore National Laboratory. The GAMA NOCO study was designed to provide a spatially unbiased assessment of the quality of untreated (ambient) groundwater in the primary aquifer system within the study unit. The assessment is based on water-quality and ancillary data collected in 2009 by the USGS from 58 sites and on water-quality data from the California Department of Public Health (CDPH) database. The primary aquifer system is defined by the perforation intervals of sites listed in the CDPH water-quality database for the NOCO study unit. Groundwater quality in the primary aquifer system may differ from the quality in the shallow or deep water-bearing zones. The first component of this study, the status assessment of the current quality of the groundwater resource, was performed by using data from samples analyzed for inorganic constituents (such as trace elements and major and minor ions), organic constituents (volatile organic compounds and pesticides and pesticide degradates), the special-interest constituent perchlorate, and microbial indicators. This status assessment is intended to characterize the quality of groundwater resources in the primary aquifer system of the NOCO study unit, not the quality of treated drinking water delivered to consumers by water purveyors. Relative-concentrations (sample concentration divided by the health- or aesthetic-based benchmark concentration) were used for evaluating groundwater quality for those constituents that have Federal or California regulatory or nonregulatory benchmarks for drinking-water quality. A relative-concentration greater than (>) 1.0 indicates a concentration greater than a benchmark, and a relative-concentration less than or equal to (≤) 1.0 indicates a concentration less than or equal to a benchmark. Relative-concentrations of organic constituents and perchlorate were classified as “high” (relative-concentration >1.0), “moderate” (0.1 < relative-concentration ≤1.0), or “low” (relative-concentration ≤0.1). Relative-concentrations of inorganic constituents were classified as “high” (relative-concentration >1.0), “moderate” (0.5 < relative-concentration ≤1.0), or “low” (relative-concentration ≤0.5). Aquifer-scale proportion was used as the primary metric in the status assessment for evaluating regional-scale groundwater quality. High aquifer-scale proportion was defined as the percentage of the area of the primary aquifer system with a relative-concentration >1.0 for a particular constituent or class of constituents; the percentage is based on an aerial rather than a volumetric basis. Moderate and low aquifer-scale proportions were defined as the percentage of the primary aquifer system with moderate and low relative-concentrations, respectively. Two statistical approaches—grid-based and spatially weighted—were used to evaluate aquifer-scale proportions for individual constituents and classes of constituents. Grid-based and spatially weighted estimates were comparable in the NOCO study unit (within 90 percent confidence intervals). Inorganic constituents (one or more) with health-based benchmarks were detected at high relative-concentrations in 10.3 percent and at moderate relative-concentrations in 13.8 percent of the primary aquifer system. The high aquifer-scale proportion of inorganic constituents primarily reflected high aquifer-scale proportions of boron (in 8.6 percent of the primary aquifer system), arsenic (in 3.4 percent), and barium (in 1.7 percent). Inorganic constituents with aesthetic-based benchmarks were detected at high relative-concentrations in 39.7 percent and at moderate relative-concentrations in 10.3 percent of the primary aquifer system. The constituents present at high relative-concentrations were iron (25.9 percent) and manganese (39.7 percent). Relative-concentrations of organic constituents with health-based benchmarks (one or more) were high in 0.2 percent, moderate in 1.7 percent, and low in 39.7 percent of the primary aquifer system. Organic constituents were not detected in 58.4 percent of the primary aquifer system. Of the 168 organic constituents analyzed, 11 constituents were detected. Two organic constituents had detection frequencies >10 percent: the trihalomethane chloroform and the herbicide simazine. For the 10 detected organic constituents that had health-based benchmarks, nearly all detections had low relative-concentrations. The special-interest constituent perchlorate was detected at moderate relative-concentrations in 1.7 percent and at low relative-concentrations in 22.4 percent of the primary aquifer system. Perchlorate was not detected in 75.9 percent of the primary aquifer system. The second component of this study, the understanding assessment, evaluated relations between constituent concentrations and values of selected potential explanatory factors to identify the factors potentially affecting the concentrations and occurrences of constituents found at high relative-concentrations or, for organic constituents, with detection frequencies >10 percent. The potential explanatory factors evaluated were land use (including density of septic tanks and leaking or formerly leaking underground fuel tanks), well construction (well depth and depth to the top of the perforated interval in the well), hydrologic conditions (aridity index, field water temperature, and distance to nearest hot spring and geothermal well), pH, dissolved oxygen concentration, study area, groundwater age distribution, and geochemical conditions. High and moderate relative-concentrations of boron primarily occurred in the Interior Basins study area and may be attributed to groundwater interacting with hydrothermal systems. High and moderate relative-concentrations of boron were associated with elevated groundwater temperatures, groundwater chemistry characteristics similar to those of geothermal waters, and distance to known geothermal areas. Boron concentrations generally were higher where low dissolved oxygen concentrations or anoxic conditions exist. High and moderate relative-concentrations of arsenic predominantly occur in the Interior Basins study area under reducing conditions. Arsenic concentrations also may be influenced by hydrothermal systems (when present). Chloroform, simazine, and perchlorate were observed in the Interior Basins and Coastal Basins study areas, predominantly at shallow sites with top-of-perforation depths ≤70 feet below land surface, with modern water (post-1950s), and with oxic groundwater conditions. Mathany, T.M., and Belitz, Kenneth, 2015, Status and understanding of groundwater quality in the Northern Coast Ranges study unit, 2009—California GAMA Priority Basin Project: U.S. Geological Survey Scientific Investigations Report 2014–5215, 86 p., http://dx.doi.org/10.3133/sir20145215.